France Feudal. Anjou. Charles I, AD 1246 to 1285. Denomination : Silver Denier. Mint : Anjou. Size : 16.8 x 17.5 mm. Weight : 0.67 grams. Grade : aVF with minor weakness in the strike. Obverse : Short cross with Fleur and an E in two of the angles, with CAROLVS COMES around. Reverse : Fulco monogram with ANDEGAVENSIS around. 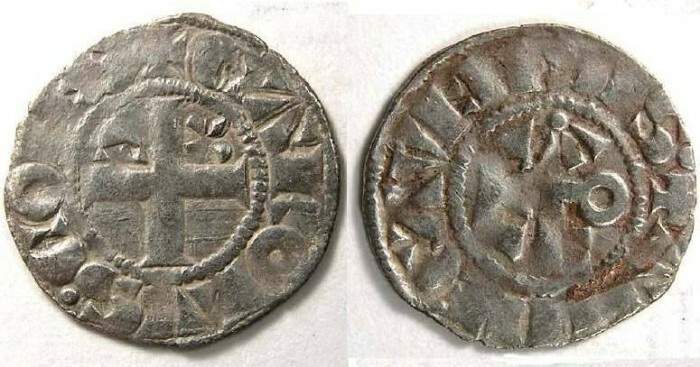 He struck this coin as Count of Anjou, and struck similar coins at the same time as Count of Maine, and between 1266 and 1285 struck coins as King of Naples.